Heat gas or charcoal grill. In medium bowl, mix peaches, bell pepper, onion, cilantro, brown sugar, lime juice and chile; set aside. Rub chili powder on both sides of each pork chop. Place pork on grill over medium heat. Cover grill; cook 6 to 9 minutes, turning once, until pork is no longer pink in center. Serve pork chops topped with salsa, or serve salsa on the side. 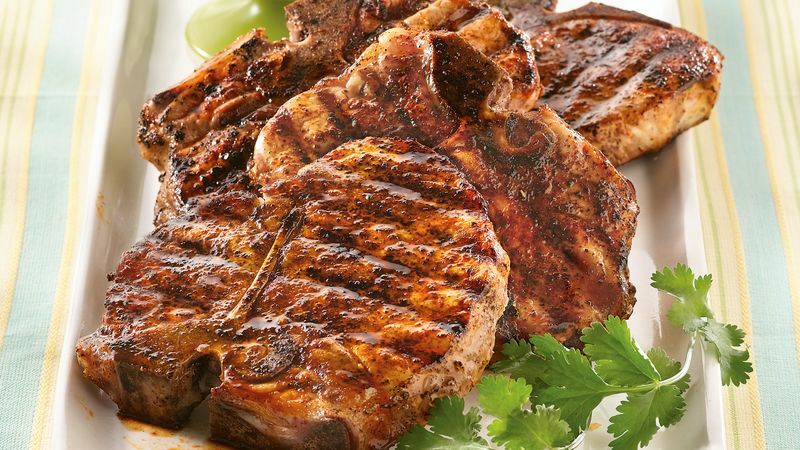 Boneless pork chops can be used instead of bone-in chops. No peaches? You can use about 1 1/2 cups chopped mango or pineapple.